The graves of veterans can be found in cemeteries all across America. In some cases the graves do not in any way denote military service. In others the graves are marked with a metal marker next to the gravestone that denotes the war in which the soldier fought. While others have icons carved into the gravestone itself that mark the soldier’s service. 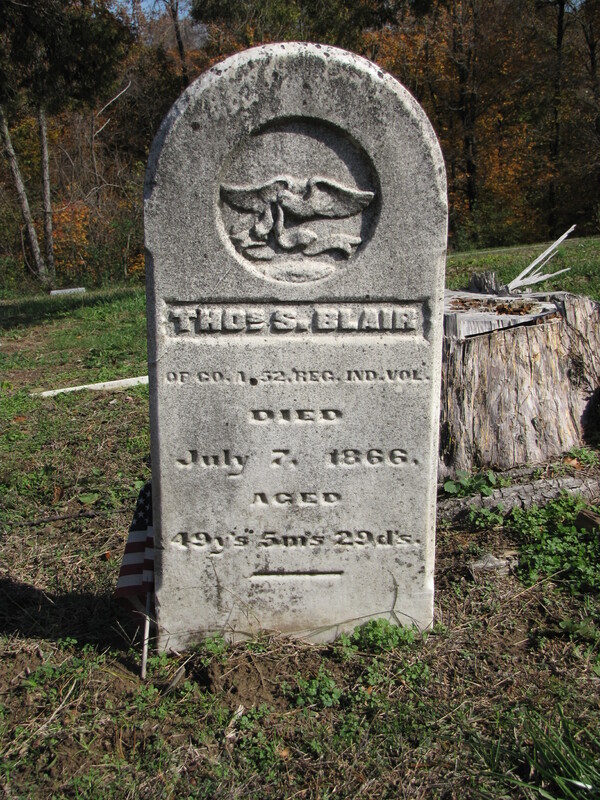 In the circular inset of the soft white marble rounded-top tablet gravestone of Thomas Blair, faded from erosion, displays the American Eagle, the symbol of the United States. His service in the Civil War is carved into his stone: Co. A 52 REG, IND VOL. Today is a day to think about Thomas Blair’s service and the service of all the soldiers who have worn the uniform. Let glory wreath they honored name.